Hares with wings, squirrels with duck beaks, snakes with bird’s heads...these hybrid, fabulous beings, origins ever shrouded in mystery, exist in many places. In the mountains between Switzerland and France, they were known as dahu; Australian aborigines would watch the bunyip; and in Bavaria and neighbouring Austria, there is the wolpertinger. The marvellous musicians of Federspiel record the location of Wolperting for the first time on their richly-coloured musical map. On their fifth album this place, somewhere in the realms of fantasy, becomes a musical world stage, simply teeming with preternatural life. Mexican melodies ring out, choral serenades are sung. Devilish dancers appear. And a simple glance out of the window turns into a story which lasts a lifetime. A blanket of clouds, punctured by pockets of blue. Not a glaring white, but oppressive. Powerful weather, somewhere behind the clouds. The great silence is amplified in my ear. A single intake of breath away. Anticipation. I had associated brass music with something else, a folksy din echoing up from the valley during rehearsals for the local fire brigade festival. A noise whose evening counterpart is the tireless parping of traditional German pop music, filling the broad halls of the festival tent after the brass band with its tears-and-sweat scented sounds. Both best enjoyed in a state of drunkenness. Ants are climbing over me. Flowers poke their umbels laden with white pollen into my nose. A gentle wobble, the wind a friendly gesture between the grasses. The world is blurred from this perspective, a many-forked green, very near to the ground, in my eyes. The dull sun presses against me. I feel its good-natured force. It could behave differently if it wanted to. But it doesn’t want to, not yet. A Dalmatian-coloured butterfly folds and unfolds its wings time and again above me, gently swaying, dotted with spots. I feel a pressure in my back, against my lungs: little elevations, the ground is nature. Two birds screech tinny-sounding scurrilities to each other over the garden, aeroplanes which take off and land, their engines high above in noise mode, down and in place, rotating. The earthy buzzing of insects near to my ear. In between is the music, which absorbs everything: a meadow symphony, different each time, new and beautiful each time. I hear singing, voices which I like very much. I have the feeling that the people whose voices these are like each other. Their silence is a friendly one, which accepts me, too. I can walk completely freely through the songs, they leave space for me and my thoughts. The meadow, which is another one, finds as good a place between the sounds as if it had been written in from the very beginning: as if they had also imagined just such a meadow when, thinking of meadows, they sang into the darkness of the microphone in the closed recording studio. I think of Hollywood in the mountains, Wicked, just a couple of sounds, then it’s faded away again. A folk song which comes in with an obvious innocence. They sing and play as if it were the same thing, as if one form of expression is as appropriate as the other. The essential is elsewhere. 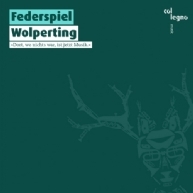 Since its creation in 2004, Federspiel has continued to mature musically, developing – initially out of consideration for the only woodwind instrument of the ensemble – a transparent tonal language far more complex in its sounds than many other brass bands. As an artistic heavyweight with a repertoire of feather-light compositions, the ensemble has long since played on well-known stages, including the Goldener Saal of the Musikverein Wien, the Berliner Philharmonie, the Elbphilharmonie Hamburg, the Vancouver Island MusicFest and Stanford University. Pioneering in spirit and yet always full of respect, Federspiel moves through traditional realms, weaving together echoes of Hungarian or Mexican musical traditions with Alpine selections, percussive styles of playing with electronic sounds, to create something new – contemporary music which is as reverent in its acknowledgement of its past as it is bold in its embrace of the future.